Our platform consists of 12 integrated modules that allow participants to connect in a new way. Designed as a toolkit, the platform allows users to combine different modules to achieve the required features and capabilities. Crowdfunding layer, enabling promising talents and celebrities to raise funds. Infrastructure layer, providing functional tools (like voting and scouting) for key platform activities. Advertising layer, delivering smart & transparent data and an engaged audience to brands for more efficient advertising campaigns (by enabling advertising smart contracts and exclusive merchandise sales). ‘Young talents need financial support’. We provide financial support to young talents at the critical junior age, so they don’t drop out of professional sports and entertainment industries. This significantly increases their chances for success. ‘Established players need help with advertising sales’. We offer representation and marketing promotion to established pro athletes and media personalities that are already attractive to sponsors but were overlooked by traditional agencies. 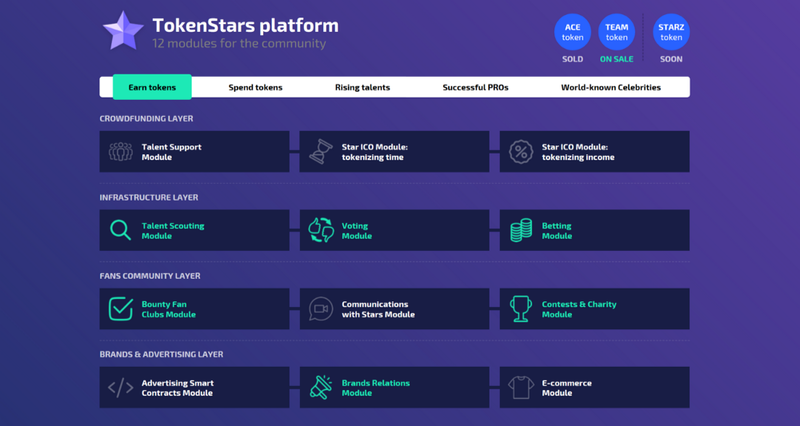 Token implementation: TokenStars receives advertising commissions (15-30%, both from pros and talents) and fees from supported talents‟ future income (5-70%, depending on the industry), which must be paid in TokenStars tokens. So, the brands and supported talents will buy tokens on the exchanges from token holders to pay for our services. 2. Fans desire much closer interaction with celebrities and more influence over sports clubs and players. We provide fan communities with a wide range of exclusive options and products that allow them to participate, analyze, critique, deconstruct, fantasize and connect with their favorite athletes and media personalities. Token implementation: by participating in these interactions, fans earn and spend TEAM tokens, increasing the demand and the turnover of tokens. 3. Advertisers. Brands seek a combination of transparent advertising formats, as well as more engaged audiences. TokenStars offers brands an opportunity to access a highly involved fan audience and increase the efficiency of campaigns by implementing advertising smart contracts. Token implementation: the endorsements and promotional services will be paid in tokens (fully or as a part of the TokenStars commission), so the higher the amount of advertising campaigns, the more tokens will be demanded on the market. Blockchain Implementation Ensures Transparency And Scalability Of Operations. We have chosen blockchain as the underlying technology of the platform to allow us to build a transparent and verifiable system for all platform participants, especially for fans, advertisers, talent scouts, and regular token holders. TokenStars platform will record in the blockchain ledger the events of interactions between the participants, such as voting results, applications from scouts, auction bids, and advertising clicks. Our platform will be based on two interacting blockchains – Ethereum for the tokenrelated operations, and a private blockchain for the internal platform operations: which was chosen because tens of thousands of people (with millions of participants in the future) will interact on the TS platform, so all these transactions will generate millions of recorded operations. Using the Ethereum blockchain to record such a large number of events would be impractical because of slow transaction speed and high transaction-related expenses. Implementing Ethereum ERC-20 standard compatible tokens allows us to avoid the usual difficulties with fiat currencies such as low speed and regulations related to cross-border payments. (Ethereum, ERC-20 standard compatible) is a utility token, designed to enable interaction between fans, celebrities (prospective talents & successful pros), advertisers, scouts, and regular token holders. TEAM tokens will serve as the platform’s internal currency and will be used in 10 modules.